Along with our premier Arctic-grade flexible wire and cable, Polar Wire Products, Inc. offers thousands of quality wiring and wiring control parts, products, and tools. Flip through Polar Wire's catalog online! Download product category sections or individual product pages using the links at right. We are a wholesale supplier of wire, solderless terminals, and wiring control products, in business for over 25 years. Our premier product line is Arctic Ultraflex Blue® and Arctic Superflex Blue® wire, a revolutionary wire rated for and proven in extreme temperatures and harsh conditions. 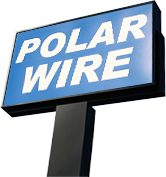 Polar Wire Products sells to the general public, as well as on a wholesale basis to government agencies, OEM's, stock distributors, and fleet accounts. If you believe your firm qualifies for wholesale purchasing, please call us for assistance. Authorized distributors are located through the country and we will work with them to facilitate your ability to purchase at competitive pricing. We supply wire, solderless terminals, and wiring control products. Aircraft quality at wholesale automotive prices.